Prime Minister Narendra Modi received a vessel carrying 16 truckloads of food and beverage consignments in containers at Varanasi, which came through Ganga from Haldia, and termed this as the beginning of a “next generation transport network” in India. Some historians claim, with this the government has revived water transport for goods carriage through the holy river after almost 150 years. 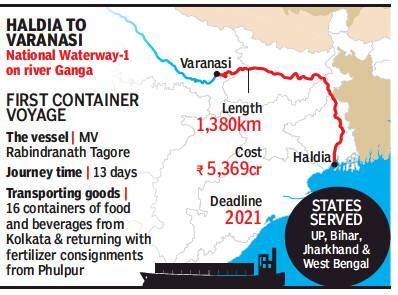 While inaugurating the country’s first multi-modal hub on a river bank, which ensures seamless shifting of cargo from vessels to other modes of transport, Modi said, “The movement of this container vessel means the eastern UP, Poorvanchal and country’s eastern part have been linked to the Bay of Bengal.” The government is developing the entire 1,620 km between Allahabad and Haldia as National Waterway-1, which can be used for transport of goods and passengers throughout the year. Shipping minister Nitin Gadkari said two feet water will be maintained round the year once the project is completed. Blaming the past governments for neglecting the development of waterways in India, the Prime Minister said, “There was a time when big vessels used to ply on our rivers. But after independence we neglected these routes rather than develop them...The waterway will not only be used for transporting cargo but this will also promote tourism and will also connect the religious places in east India to the east Asian countries. Varanasi and other areas in the eastern region will also be popular for cruise tourism.” He added the products including hand loom and textile products from Varanai and the nearby regions can be transported to other parts through the waterway. On the government move to revive the water transport facility, historian Prof Rana P B Singh said, “As per English scholar James Prinsep, goods transportation through waterway up from Kolkata to Varanasi and other eastern destinations had remained continued till 1832. Wood, sandalwood, silk, spices and salt were mainly brought to Varanasi market by traders through the waterway.” According to historians, with development of road and rail networks followed by construction of Malviya bridge in 1887 traders shifted from the water transport for goods carriage, which had been continuing since ancient period. Industrialists and exporters of the region hailed Modi for making Varanasi a gateway of the first modern water transport system of the country. R K Chawdhary of Ramnagar Industrial areas estimated that the city would soon become a north India hub for export and import through water route and it will be immensely beneficial for local industrialists and exporters/importers.